Mmkay… So what to do when my research requires that I “socialize openly” with members of two groups which are adamantly opposed to one another? I’m just beginning this grand adventure, so I don’t yet have stories of consequences, but even the typical everyday porousness of Facebook privacy is troubling enough: what do I make of the new local friend who’s been been browsing my high school classmate’s wedding pictures? How wary should I be about interacting with one community or the other, given that my comments and questions on one page–and the group’s answers and responses–will become visible to members of the other group, especially if we “friend” each other? Will I be inadvertently exposing information meant to be internal or private to a wider, possibly hostile audience? In a way this is a familiar concern for any social researcher, perhaps especially ethnographers, whose work is uncovering and publicly discussing the inner workings of social groups. Yet the immediacy of Facebook’s exposures troubles me; while the ethical concern is the same, as a practical matter the consequences of revealing a secret in a publication four years after the fact are a bit different from making that same secret public in a matter of moments. More important, the decisions about what to make public and how to release the information is controlled neither by me, nor by the people I’m working with, but by a corporation totally disconnected from any of the real social networks it claims to represent in digital form. In short, it’s unfortunate that control over data is so far out of the hands of its producers. And if you have any suggestions for how to manage these issues in the field, please let me know.I toyed very briefly with the idea of creating separate accounts for each group I want to work with, which would also separate my “personal” profile from my “professional” profile, but it was simply too unwieldy. Not to mention that it immediately becomes difficult to separate these two spheres once you’ve made any kind of relationship with people “in the field.” When I go snowboarding with people I meet here, are they potential research subjects? Friends? while the old law made it a federal offense to “willfully and knowingly” enter a restricted space, now prosecutors need only show that you did it “knowingly”—that you knew the area was restricted, even if you didn’t know it was illegal to enter the space. Lithwick and Vasvari point out that given the proliferation of “restricted areas” in the last decade or so, this seemingly minor change may have dramatic consequences for the practice of political protest in the US, making it easier to prosecute political speech in any undesired location as a federal crime. He stood behind a microphone, one hand hidden in the pocket of his black velvet jacket, his eyes gazing intently into the audience. His other hand gestured, at times gently, at times prodding and striking the space around him or combing agitatedly through his gray hair. He spoke with the full range of his voice: beginning quietly, as if in the middle of an intimate conversation; then full and passionate, trilling his Rs like a singer; the next moment almost whispering. This was a performance, not a reading. When he had finished, the audience applauded with real enthusiasm. One of the themes in his film was the importance of art and music for spiritual life. Striving merely for wealth or pleasure–these are empty, leaving one’s soul impoverished. In his film, literature, classical music, and art were thematically united with Russia’s religious traditions and juxtaposed against the spiritual void of capitalism’s excesses. The recitation of a poem might then be viewed as a small gesture toward bettering society. I uploaded a few photos of Red Square from last week to my Flickr site. It was a crisp, cold night, quite peaceful after the election rallies. 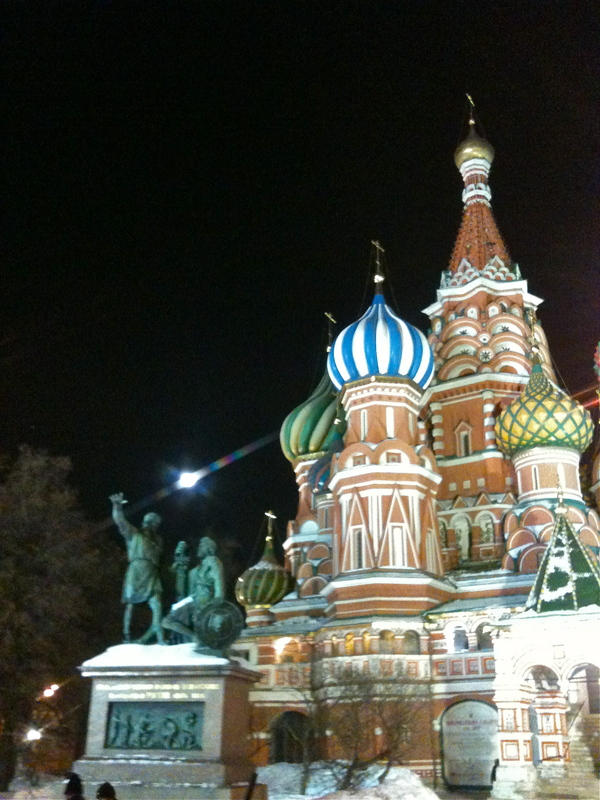 Red Square always has quite a few tourists and sightseers, even at night. One thing difficult to catch in a photo is the grand scale of the square: Coming through the Resurrection Gate onto the square, you walk slightly uphill, adding to the sensation that the Kremlin and the Cathedral are at a great distance. 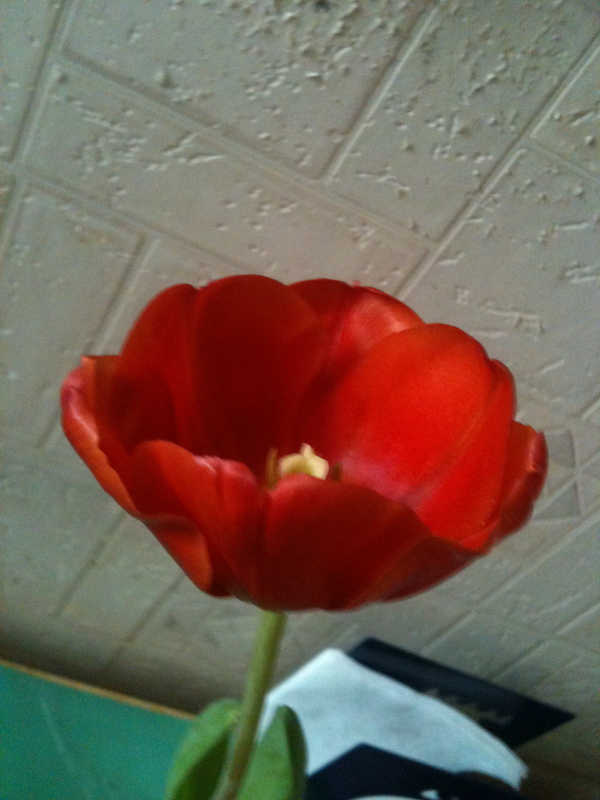 My new yoga studio gave all the ladies tulips for the 8th of March. Super nice! 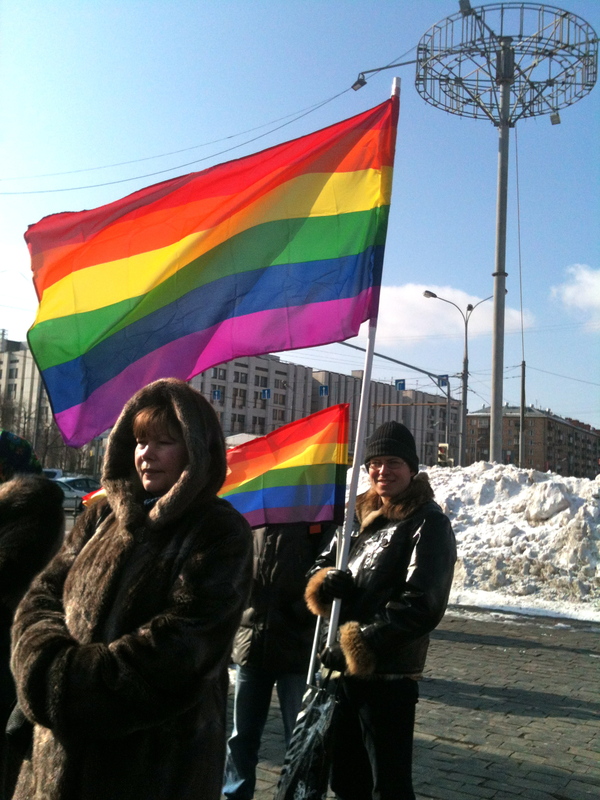 Yesterday (March 8) was International Women’s Day, which was a major official holiday in the Soviet period. Official Soviet ideology had declared women equal to men shortly after the Revolution–Huzzah! Curiously, many women continued to feel surprisingly unequal through the rest of the century despite official statements. They pointed to the fact that women were not only expected to work full time, but also to do all the housework and childcare; they were also largely excluded from the upper echelons of political power. But every year on March 8, the tables turned: women were gifted with flowers and chocolate from the men in their lives! In the lead-up to yesterday’s election, newsmedia in the West have paid a lot of attention to the increasingly active and visible political opposition in Russia. It’s certainly a change; rallies of thousands, or tens of thousands, of Putin’s opponents simply haven’t existed previously. Change is news. But what is the opposition? For now, at least, it’s a momentary alliance of convenience between those with some power and those without, people connected to political institutions and people who want to tear them down: the remains of the Communist Party (whose candidate Zyuganov won a distant second place! ), liberals who are never allowed on the ballot, nationalists, anarchists, whatever you call the unknown person in the Guy Fawkes mask who hovers around every rally these days. 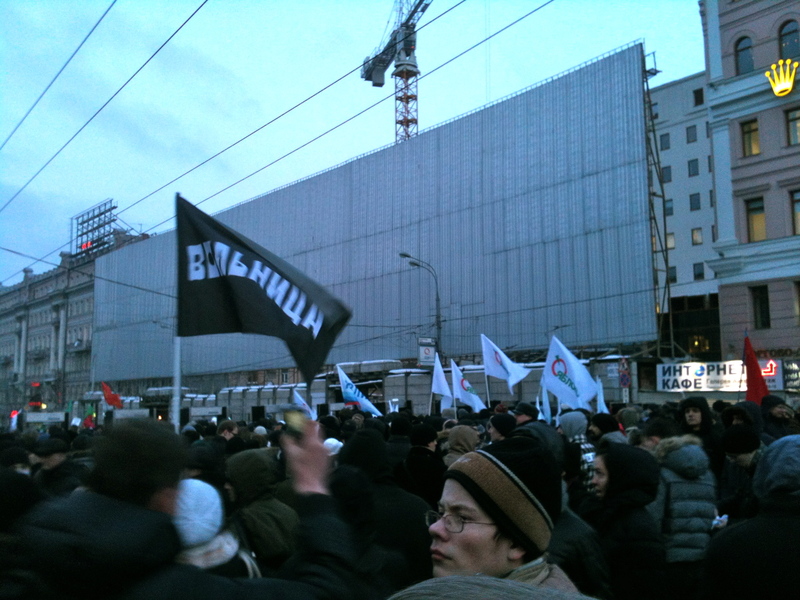 All were in evidence at the official sanctioned meeting on Pushkin Square in Moscow tonight. I met up with “Dmitri,” a member of a local activist group, to attend the meeting. He kept an eye on the police presence, made sure I got a white ribbon, and offered a little commentary along the way. He had participated earlier in monitoring vote counting and said he hadn’t personally seen anything untoward, that there surely had been some falsification but in truth, Putin had certainly won a majority of the votes. This of course is one problem with the obsessive coverage in the US on the outrage over falsification (ballot stuffing, multiple voting, and so on). The ruling party’s control over the political system actually begins much further up the line: as Dmitry pointed out, they already control the main television stations most people rely on for news. Opposition candidates aren’t always allowed onto the ballot in the first place; until very recently most opposition rallies were small and usually cut short by arrests. The election itself is almost a formality, but clearly a potently symbolic ritual for American viewers. So you could say that the opposition is those who are frustrated with this situation, though they may share very little other ground. 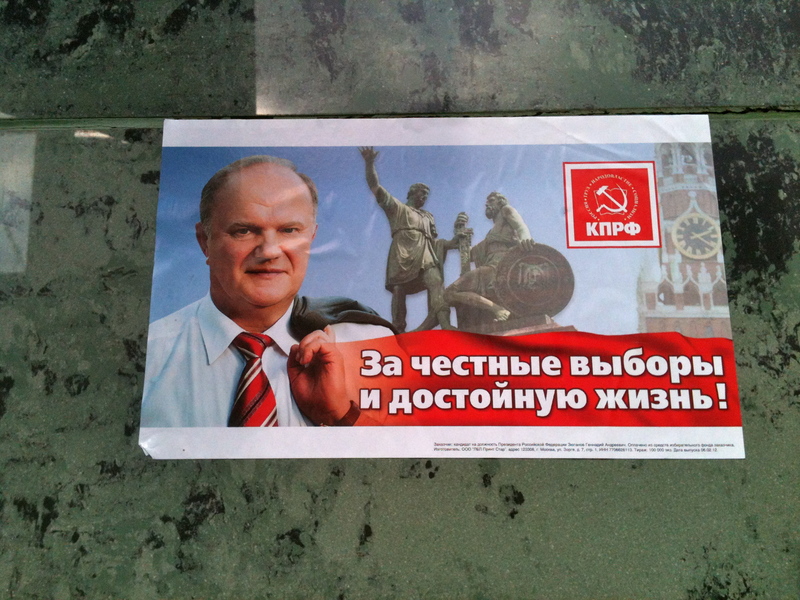 Here’s a pro-Zyuganov sticker I found outside a metro stop: “For honest elections and a decent life!” Is Zyuganov part of a fresh pro-democracy movement bubbling up in the new urban middle class? As a long-time losing presidential candidate for the Communist Party–not so much. But he can still take up the cause! And indeed, there were some red flags a-waving tonight. In the long term, though, this raises a set of problems that seems always to challenge political oppositions: ideology purity or pragmatic alliances; revolutionary change or reforming existing institutions? Are the liberals willing to work with the Communists to oust Putin? Can anyone convince the anarchists to help form a new political party–or do the anarchists have it right after all? How can people enact political change? 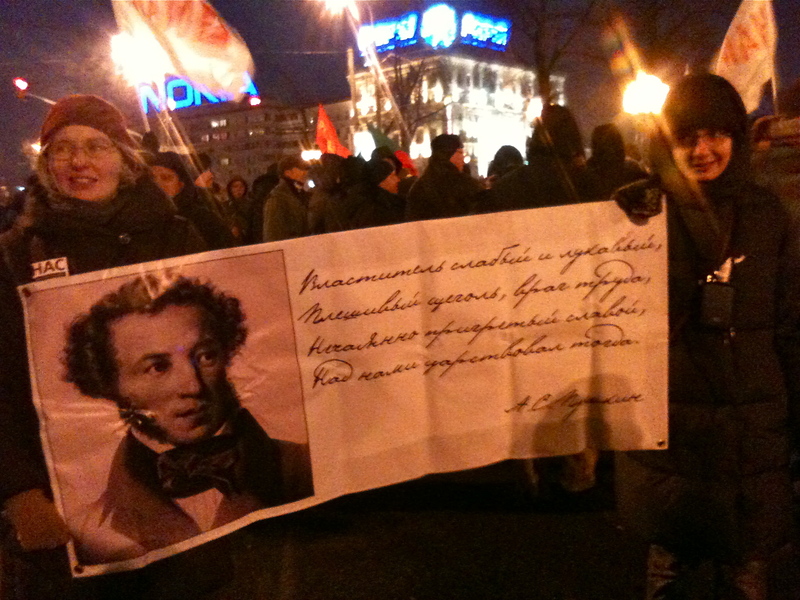 Beloved Russian poet, Aleksandr Pushkin.